STEVEN S. LITTLE is a much sought-after expert on the subject of growth and the future of opportunity. A former president of three fast-growth companies, he now advises thousands of leaders of growing organizations and communities each year. To learn more about Steven and growth, please visit his Web site at www.stevenslittle.com. Section 1. 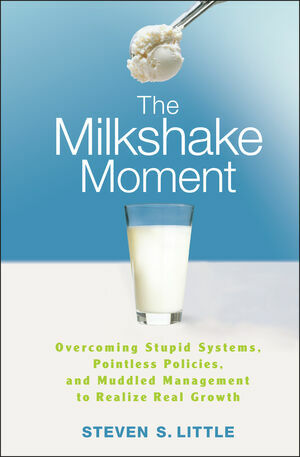 The Milkshake Moment. Chapter 1. It Was a Dark and Stormy Night. Chapter 2. Half Empty or Half Full? Chapter 3. This is NOT a Customer Service Book. Section 2. Foster Grow vs. Status Quo. Chapter 4. A Brief History of Organizations and Man(agement). Chapter 5. Stop and Consider the Nature of the Modern Organization. Chapter 6. Toddlers and Trust. Chapter 7. Some Shocking Behavior. Chapter 8. Lessons from the Cubicle Farm. Section 3. Place Purpose Before Profit. Chapter 11. It’s Never About Money. Chapter 12. The Wizard of Westwood. Chapter 14. NoClu Motors, Inc.
Chapter 15. Purpose in the Plan. Chapter 16. Getting it Right. Section 4. INSOURCE Crucial Judgment. Chapter 17. Edicts Made on High. Chapter 18. Peeves from Below. Chapter 20. How ‘bout Them Pomegranates? Chapter 21. Come Harter or High Water. Section 5. Address the “People Problem” Problem. Chapter 22. The Ballad of the Black Box. Chapter 24. Why People Work. Section 6. Care For Customers. Chapter 25. Home Team Drops the Ball. Chapter 26. The Big Secret to Great Customer Service. Chapter 27. Even Geniuses Struggle To Serve. Chapter 28. It Takes a Hero. Chapter 29. The Future Is Already Here. . .Some Folks Just Aren't Getting The Memos.